The audience takes its seat. Cue utter darkness and a single spotlight on the star of the show: Tap Griot, played by the impassioned and soulful, Omar Edwards. As Tap Griot's shoes begin to tap the stage floors, the audience, captivated by the contrast between the lack of light, but breathtaking sounds of emotion, takes a brief journey through the hardships of African American History - from the Middle Passage, to Jim Crow, to the Civil Rights movement - but then pauses as the traveling comes to a sudden halt. An older version of Chet, played by the vibrant Desmond Newson, transports spectators to the U.S. Capitol steps in Washington, D.C. Tap Griot's struggle with the overwhelming honor bestowed upon Chet on that very twentieth day of January 2009 and the confusion of sentiments for Chet's former occupation as a Tuskegee Airman, echoes in Chet's profound commentary to the sea of reporters on the steps of the Lincoln Memorial: "History is the river we stand in." Therein commences the flashback and eighty subsequent minutes of tribute to the valiant Tuskegee Airmen. Hence begins FLY. The ensuing homage paid to the elite group of African American fighter pilots from Tuskegee University, thrust overseas to guard American bombers flying over Europe and North Africa during World War II, could not serve as a more fitting addition to celebrate Black History Month in 2016. Ricardo Khan and Trey Ellis's mastery of drama and poetic genius reflects in the visual elements combined with clever dialogue and accurate historical context. The Red Tails, or 332nd Fighter Group, in particular, uphold a reputation for revolutionary heroism - not only on the battlefield, but also amongst their White airmen counterparts. History came full circle during this past Sunday's opening night performance, during which the surviving Tuskegee Airmen could be seen marveling at their stories on the stage. Khan and Ellis' skill for seamlessly inviting all generations of patrons shines through in the unique projections found in the background of the actors. During an interview on the campus of Loyola Marymount University on January 28, Khan spoke about the process of "learning to fly," which, arduously, involved shadowing a select handful of the Airmen, in order to properly mimic the actions of flying onstage. For this reason, the audience's bewilderment at the verisimilitude of flight justifiably links to the evident extensive practice and acute talent of the entire crew. Mid-first act, during the four main characters' preliminary flying examinations, each audience member took flight on a wholly different journey than the previous. The flawless sound effects flowed effortlessly with the scenery projections and dramatic, yet all the while, comedic performances. 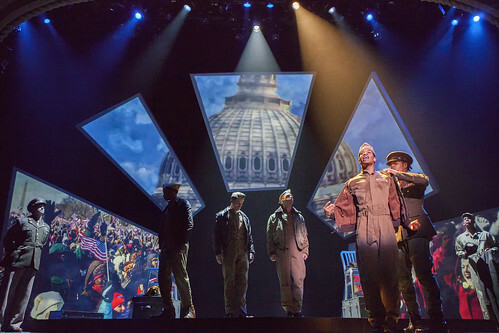 Each of the four leading men of the ensemble provides viewers with an Airman with whom to identify. In W.W.W. - W.W. for short - commonly known as "What Women Want," brought to life by the suave Brooks Brantly, a twist on the stereotypical "ladies man" can be found, tugging on the heartstrings of all ladies watching the performance. Oscar, or Terrell Wheeler, epitomizes brilliance in the archetype for his race. Oscar remains faithful to his admirable values and pride for his heritage, reminding viewers that each of the Airmen ventured to the University with, perhaps, diversified goals, yet, nonetheless, a common intention to serve their nation as African American (to-be) heroes. 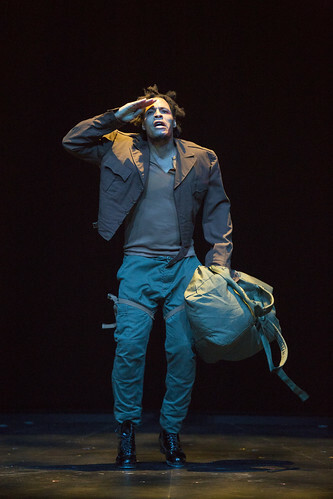 Damian Thompson's interpretation of J. Allen, a pilot from the Caribbean who channels a perspective of training veering more towards English than American, supports this idea that a plethora of backgrounds can be united by a common goal: to win the war, to fly, and to put African Americans on the map as apt pilots, just as any others. The interactions amongst the four Tuskegee Airmen and their White officers or fellow fighter pilots represent camaraderie and unity, which, essentially, drove the U.S. to WWII success. Race as a social construct threads in an arguably clandestine fashion throughout the plot; similar to Tap Griot's continuous dancing to personify emotional turbulence, the issue or theme of racial discrimination takes second to a story of heroism, above all. Khan and Ellis's noteworthy writing refrains from shoving discriminatory behavior in the face of the onlooker. 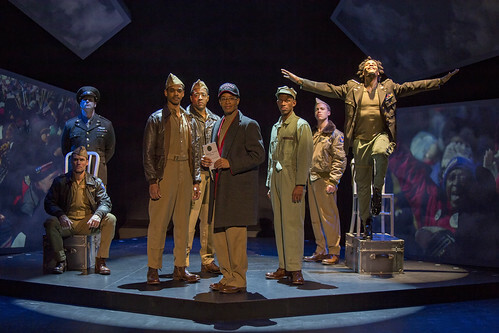 Rather, comedic references allude to the centuries of hardships faced by African Americans; nuances of ethnic inferiority plant seeds in viewers' minds that the path of the Tuskegee Airmen represents the furthest tale from a walk in the park, on many fronts. FLY touches upon brotherhood, death, and fear - to name a few. Standout comedic moments include the scuffle between the men in their quarters, quickly disguised as an intense workout session, complete with make-believe pushups, to impress the White officers. The dance scene evoking African heritage in front of the fire prior to the big day in the sky brings the audience to an enlightened laughter, followed by worry for the men about to embark on the most significant mission of their lifetime. The emotional ending, tracing back to the opening scene with Chet's awe-inspiring moment in D.C., recalls the line: "History is the river we stand in." FLY, an entertaining, epic production, leaves each of its captivated and emotionally-struck viewers, in tears of joy, pride, and sadness, simultaneously. The ninety minutes to-be-cherished pass by too quickly but encourage twenty-first century Americans to reevaluate history as a continuously flowing basin, full of memorable moments and unbelievable achievements that construct the United States as the sovereign nation that now stands. The presence of the Tuskegee Airmen at opening night inspires all artists to take a stab at imprinting a mark on this ever-flowing "river" that invites all to stand in and with - to celebrate components of a historical track record that defines America as "united." History takes flight gracefully at The Pasadena Playhouse throughout the month of February - to not only celebrate Black culture but also to embrace heroes that forever changed its course. For additional information on FLY please visit: www.pasadenaplayhouse.org or call 626.356.7529. The show is performing until February 21, 2016. You may use code LC20 for 20% discount on select tickets.